Some of the best documentaries of this century feature trajectories that lead up to a competition that requires a specific talent, be it a spelling bee (“Spellbound”), a dance-off with grade-schoolers (“Mad Hot Ballroom”) or a crossword-solving tournament (“Wordplay”). 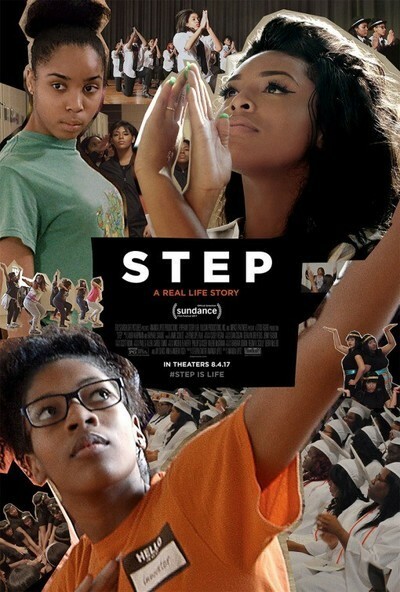 This film, however, is a soul-stirring, foot-stomping and inspirational step beyond most in that its final showdown is only the beginning of a path towards a brighter future for the participants—namely, members of a step team who are about to become part of the first graduating class of the Baltimore Leadership School for Young Women. "Step" is both a buoyantly uplifting celebration of African-American womanhood and the dedicated educators who have their backs. The real prize here isn’t a trophy but the assurance that each and every senior will head off to college despite the obstacles they face in their daily lives. Filmmaker Amanda Lipitz, a Broadway producer making her feature-length directing debut and a Baltimore native herself (she and her mother were involved in the founding of the BLSYW charter school in 2009), focuses on three distinctly different members of the Lethal Ladies squad. Blessin Giraldo, with her dimpled smile and innate sense of style (oh, the hairdos you will see), is blessed with movie-star glamour, fierce determination, a palpable physicality and an outsized personality that immediately designates her as a leader. But academically, Blessin is adrift. Her single mother, Geneva, is prevented from being fully engaged in her daughter’s life as she copes with waves of depression and anger issues. These are traits that her daughter also deals with. She missed 53 days of school in her junior year—causing her to be banned from the team—and her absence hurt her fellow steppers as they went up against other crews. But she and her no-nonsense college counselor Paula Dofat, whose only goal is to make sure that each and every girl has the scholastic and financial means to pursue a higher education, double down on trying to get her GPA off of life support during her final year. Events beyond the world of academics intrude as well. Lipitz just happened to begin filming in Baltimore in 2015, when Freddie Gray died while in police custody. The racially-charged backdrop adds both urgency and a currency to what happens to these girls. There are shots of inner-city memorials and murals in his honor, and the team’s tough-love-oriented new coach, Gari McIntyre, grew up on the same street as Gray. The theme of “Black Lives Matter” informs the choreography of a routine (chants include “Hands up, don’t shoot” as well as “I’m black and I’m proud”) that the Lethal Ladies perform in a city-wide warm-up competition to the ultimate event that will include teams from Maryland, Virginia and Washington, D.C., districts. It is all but guaranteed that team members, whose spirits start to flag during their grueling run-throughs, will likely not go away empty-handed. That is especially true after we get a full blast of sisterly swagger when they slo-mo walk, Tarantino-style, down a school hallway to local hip-hop artist Tate Kobang’s “Bank Rolls” as they prepare to compete in Bowie, Md. But what is less certain is the fate that awaits Blessin after she is interviewed by two women for a special bridge program that will ease her entrance into the rigors of college. That results in what is one of the most moving moments in “Step” after Blessin exits the room and Dofat, knowing that this will be her best and perhaps only chance to succeed, breaks into tears while pleading her case. This clearly is not just a job. It is a mission, a calling, a way to guarantee that this generation of young African-American women is bestowed with all the chances they deserve to rise to their full potential. Lipitz manages to organically contrast the lives of the older women in the film—dropping out of college, dealing with teen pregnancy, becoming entangled in an abusive relationship—with the opportunities afforded the students without being preachy or forcing the issue. And she is able to showcase the performances with gritty panache and flash. Part “Hoop Dreams,” part “The Fits” and part “Bring It On,” “Step” is one of the year’s more meaningful and enjoyable docs. And, considering her inherent showbiz flair, I am guessing we haven’t seen the last of Blessin Giraldo.